Welcome to my second post of February’s Project Fairy Tale! In case you missed my first fairy tale post, my story to focus on for the month is The Boy Who Cried Wolf. Today, I’m reviewing a delightful retelling of this well-beloved fable written by the fabulous Gail Carson Levine! If you’ve never read anything by Gail Carson Levine, shame on you! Get out there RIGHT now and start with Ella Enchanted. You won’t be disappointed, I promise! Betsy is a new shepherd in Bray Valley and she’s determined to be the best! Not only has she completed Shepherd School, but she’s also taken the Shepherd’s Oath. This is serious stuff. Betsy carries around a whistle and wolf-sighting checklist along with her adorable staff. The first time she takes her sheep out to graze, she spots a wolf! Now, this isn’t like in the fable. There really is a wolf. His name is Zimmo and the poor guy’s terribly hungry. Betsy, doing what any good shepherd would do, blows her whistle and calls out for the villagers for help. When the townsfolk get there, Zimmo hides himself in the bushes and they don’t see him. They think Betsy is just making things up–like another shepherd in Bray Valley’s past. Betsy is not to be discouraged, though. She knows she saw the wolf. Betsy goes right back to work keeping watch over her flock. Zimmo the wolf, somewhat a compassionate soul, lets Betsy attend to things for a little while before he jumps out again. Betsy cries out, “WOOOOOOLF!” Again the townsfolk come running, but Zimmo scampers off again. Disgruntled with Betsy, the villagers send her back to Shepherd School. They give her flock back the next morning, but warn her that it is her last chance. When she’s out with her sheep, she again sees Zimmo. Since the wolf is sure the villagers won’t come again, Zimmo snarls and growls at the sheep. Betsy’s lunch pail falls over and when Zimmo sees the delicious food inside, he forgets all about the sheep. Betsy shares her lunch and in doing so, gains a friend in Zimmo. Not only does he leave her sheep alone after that, but he helps her to herd and tend them. Zimmo becomes a member of Betsy’s little family and they keep their flock together forever after. I thought this was a delightful rendition of The Boy Who Cried Wolf. Betsy is a good, hardworking, and honest girl. There is no deception in her. Zimmo is just a hungry wolf who often feels compassion for how he’s making the villagers mad at Betsy, but a wolf has got to eat! I loved how he ended up helping Betsy herd the sheep in the end after she fed him her lunch. This was a clever way for Levine to incorporate the shepherd and sheepdog element to the story. I thought this was a wonderful way to not only redeem the original fable about a wicked, lazy boy, but to also bring a very thoughtful moral to children’s (and adults’) minds. In some ways, Betsy’s tale reminded me of Lucy’s role in The Lion, The Witch, and The Wardrobe. She really did go to Narnia and visit wild creatures, but her siblings didn’t believe such a fantastical tale. 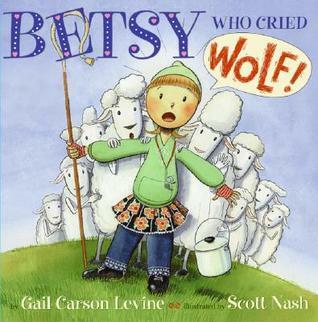 If you’re looking for a great book to share with your little ones or class at school, I would highly recommend Betsy Who Cried Wolf! As well, help any children you are reading to become aware of the images inside the story. The illustrator put lots of hidden treasures that added depth to the story! There you have it, ladies and gents! I hope you’ll check out this story and the many others the bloggers are reviewing during Project Fairy Tale!